MANCHESTER ART GALLERY - ANNIE SWYNNERTON EXHIBITION. Welcome to another news page at Richard Taylor Fine Art. So what have we been up to lately? Well we recently had a day trip to Manchester Art Gallery to see the wonderful Annie Louisa Swynnerton exhibition as we have two of our paintings on loan to them for this year's exhibition. Jebsa - Roma Lady - Swynnerton's first known oil painting, painted in 1874 and The Debutante painted in 1891. 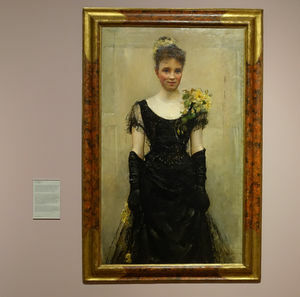 The portrait is believed to be Elizabeth 'Elsie' Ebsworth who became a prominent society hostess and unusually for her class, a singer. 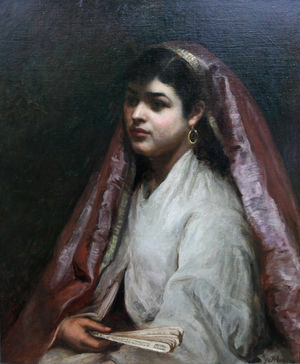 She was later painted by Singer Sargent and Sickert. Swynnerton (1844-1933) was a 19th century Victorian artist and active in the women's suffrage movement. She was elected the first female associate member of the Royal Academy in 1922 aged 78 which prompted a retrospective of her work at the Manchester Art Gallery in 1923, ensuring her legacy. It was a good experience to see our paintings in the museum context as part of the exhibition. 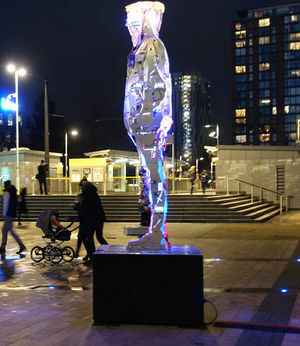 If you would like to see the exhibition it runs until January 6th, is free and is well worth a visit. STANZA YOUTH CULTURE AT MANCHESTER LIGHT WAVES. We have over six hundred new paintings in stock and over the next few months they will be appearing online on this website. Every month new stock is added and these are featured in the New Paintings section.